Our Gold Web Plan has heaps of diskspace and features, at a very affordable price. Not only that, you can also host an UNMETERED number of websites on this plan! If you have 30 websites, this works out at less than $1 per website! 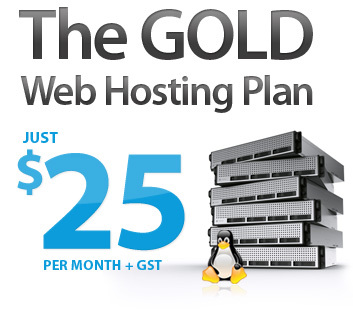 As with all our other hosting plans, our Gold Web Plan is packed full of advanced features. You are also able to self manage all aspects of your webhosting yourself, via the Online Management Console, allowing you to add email addresses, sub domains, etc , using just your web browser. Check out a full list of the main features by referring to the table on the right hand side of this page. To compare this plan with our other plans click here. Ready to order this hosting plan? Simply click the button below. NOTES: As a rough guide 1000MB (approx 1 GB) data transfer is approximately equal to 7,000 - 10,000 webpage visitors/month. As a rough guide 100 MB disk space is approximately equal to 1000 website pages. Actual numbers would depend on the size of your webpages. Unused bandwidth expires at the end of each month. Domain Registration Charges are an additional fee, and are not included in the hosting plan price.